Mochizuki’s book is great for kids who are interested in sports and people. My girls enjoyed learning about the struggle that Japanese American children had to face during World War II. The best part of the book is that it provides the reader with a clear positive message of hope and perseverance. The children and families in the book were faced with a lot of pain and disappointment after being forced to live on an internment camp, but they overcame their fears by helping each other and finding something they could love together–baseball. We would definitely recommend the books for kids in grades 1-4. This is a sweet book that kids who are early readers can read on their own. This is great as bedtime storybook for children. We liked that the book is written from a boy’s perspective. The boy is very observant, compassionate, and thoughtful. The illustrations are gorgeous and reminds us not to take anything in our lives for granted and encourages children to think of others. My kids read this book on their own and then to me. They shared that they liked the book because the baby was able to stay with her mother while she worked and did different things. The story is told from the baby’s perspective, but the language the child uses is advanced. The author uses onomatopoeia to help the story come alive, which my children really enjoyed. The illustrations are beautiful. The setting of the book is in the West African country, Mali. My kids were surprised that the mom did not have a lot of tools or resources like we have in America. My girls thought the book was very short and we would recommend this book for kids prek-3rd grade. Have you ever wanted to share powerful messages about love and fortitude with your children? If so, Rosa is a great story to share with your child/children. The story is about the phenomenal civil rights pioneer Rosa Parks. The book provides a background story to give children a full understanding that Mrs. Parks was not only a woman who stood against injustice but a regular person with a job and family. The book talks about the civil rights movement and bus boycott from the point of view of an observer. It also shares more about women and their role in the movement. 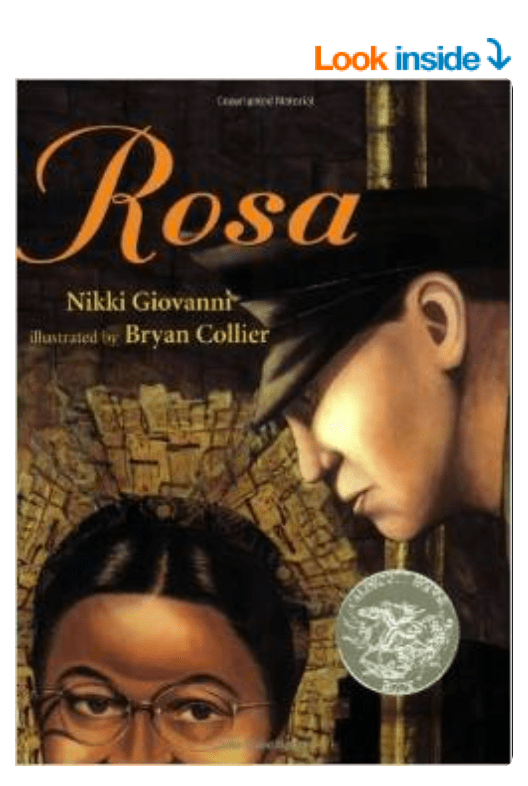 The book also helps children understand the political climate of the civil rights movement and how Rosa Parks’ courageous decision helped influence other major decisions during the 1950s and 60s. My daughters shared that they enjoyed the story because it had a happy ending.